Balanced power is a new technology that has captured the attention of most every professional sound and video production company. Over the past 6 or 7 years, balanced power has grown enormously in acceptance and recognition as an emerging standard in professional audio and video media production. Today, most professional recordings are produced with balanced power. Today’s producers of ultra clean DVDs and music hits have incorporated this technology as a means to get the most from their professional equipment. The reason why is because balanced power effectively maintains the lowest possible noise floor in their electronics. This allows for the purest sounding and cleanest looking audio and video reproductions. The Wide Screen Review Holosonic reference system uses balanced power from Equi=Tech for this reason. Balanced power arrived on the scene in the mid-90s. References to it can be found beginning in the 1996 edition of the National Electrical Code (Article 530 G.) Today, it is used in most every high-end professional recording and production facility. Let’s be frank about this. It’s not a small difference in sound or in video quality that we are talking about here, but rather something on the order of astonishing. Professional engineers who use balanced power routinely report an increase in dynamic range in their systems of between 16dB to 20dB. This is huge. What this means is that very subtle details that were once lost now appear in the music and in the video image that were once imperceptible. Performances are closer to live than ever before. Reducing background noise adds to the clarity of both audio and video. Something to understand about balanced power is that it is a system of providing electricity that is different from “wall power.” The design configuration and the voltages on the electrical circuit wires are not the same. The balanced power topology delivers electrical energy to electronic equipment power supplies in a different way than any other system of AC power delivery. Typical power circuits in the U.S. are nominally 120-volts to ground. In a balanced power system, the voltage to ground is only half of that (60 V.) But with at trick called inverse phasing, the normal 120 volts that audio and video equipment requires is still present between the two main wires in the power circuit. The power supplies still see 120 volts as usual so everything works. Notice that we have established a connection between the two batteries. At one point, the plus (+) end of one battery is connected to the minus (-) end of the other. If one measured the voltage between the two extreme ends of the connected batteries, one gets 3 Volts because the two 1.5-volt batteries are connected in series. But, what if we grounded the batteries by connecting a ground reference wire to the point where the batteries are connected? Right dead in the center of all of this. If we used that common connecting point as a ground reference, we would now measure plus 1.5 Volts from ground to one end of the pair and minus 1.5 Volts to the other end. By adding a ground reference (zero volts) midway between the two batteries, we have created balanced power. On the output of an AC power transformer are two secondary coils that output 60 Volts (to ground) each. They are connected in series to each other just like the flashlight batteries in the first example. But here, they add up to 120 Volts AC. Note that across the two main lines feeding the equipment we still have 120 Volts being delivered with only 60 volts present to ground on each wire. Since this is AC power, the two mains alternate between plus and minus, 60 times per second, but always opposite each other, always 120 Volts (RMS) apart from each other. The term for this mirror image power topology between the two mains is “inversely phased.” Balanced power consists of two 60-volts to ground AC conductors that are inversely phased. In a manner of speaking, the “batteries” in this case are coils connected in series and referenced to ground at the point where they connect. That’s all there is to it. A visual example of this natural electrical event could be seen at the beach. Perhaps one has noticed small waves that roll back towards the ocean from the shore while the big waves are coming in the opposite direction. A nearly identical event is occurring all of the time on the ac power lines beginning the instant one turns on the component power switches. And it continues ad infinitum. In the world of electrical reality, this is “reactive power” that normally goes where it’s not wanted or needed, like through your grounds, your chassis and your cable shields and run amuck through your electronics. Noise. Notice in the illustration (Figure 3) that in a conventional power circuit, one of the mains is grounded. This wire is often referred to as the neutral conductor. Note in the illustration that reactive currents in the neutral conductor are connected to ground and therefore also present in the ground wires and equipment chassis as well as all of the grounded shields in a/v cables. These are not good things to have running around your ground, which is referenced to your sensitive a/v circuits. To a design engineer, something referred to as “gain” in audio circuitry is limited by the noise in the system. When the noise comes up to where you can hear it, back off your gain a notch and that’s zero. Every signal above zero is music, we hope. Every signal below that point is lost in the noise floor. If we are to recover those subtle signals that provide us with detail and realism, we’ve got to eliminate the noise. That’s all there is to it. But let’s take this discussion just one step further so we can see just how sophisticated the Equi=Tech Wall Cabinet System used in the Wide Screen Review Holosonic reference system really is. There are some important factors to consider from an engineer’s perspective that can drastically affect the efficiency of a balanced power system. Or in other words, will it work and how well? Here is where accuracy provides us with great value. When we say accuracy, we mean phase accuracy. In this case however we would be referring to “inverse phase” accuracy. These reactive currents must be perfectly opposite each other to achieve total annihilation of noise. To the degree that they are more and more out of phase, lower and lower frequencies will still be present in the noise spectrum. A very accurately balanced system will have a very wide bandwidth of noise rejection, well into the megahertz range where digital signals and high frequency modulated signals in analog circuits reside. A run-of-the-mill balanced power transformer will roll off around 1 kHz meaning that little if any high frequency noise will be attenuated. The Equi=Tech system uses a patented “bifilar” AC power transformer winding method which very cleverly balances it’s two output coils like identical twins. By maintaining near perfect phase accuracy this way, this method effectively reduces high frequency harmonic currents to the point where digital jitter in audio equipment is reduced by as much as 70%. Now that’s exciting and incredible to consider but also documented and true. What this means in audio playback is an astonishing difference in imaging, detail and openness. From an analog perspective, the balanced power system lowers noise to the point where details formerly lost in the noise floor suddenly appear as if live now for the first time. Bass is also deeper, tighter and more defined. In a video system, blacks are blacker and colors retain more detail and have less bloom. Speckles disappear. 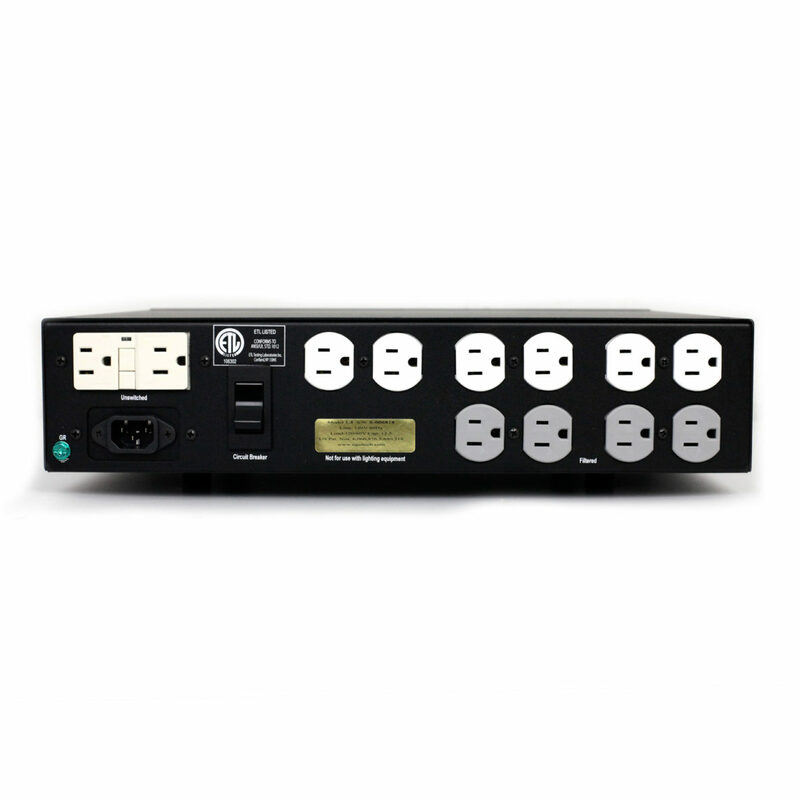 Balanced power has already made its mark in pro audio and video. The new 2002 National Electrical Code provides new provisions for balanced power to be used now for all sensitive electronics. To an electrical engineer, balanced power is simple science. To a home theater system, it’s as right as rain. A few years ago I bought directly from you a factory-reconditioned 1.5RQ unit and with every equipment upgrade I appreciate your work and product more and more . I’m a member of our River City Audio Society here in San Antonio , Texas and I want to give a presentation to our group on the value and technology of Balanced Power . I’m still a bit computer illiterate and can’t get my printer and computer to cooperate . My title in the group is Music Director , basically the DJ at our meetings . I’m a 69 year old USAF veteran with electronics training . Hello Joseph. Sorry for the late response. We usually answer emails very quickly, and don’t have the personnel to respond to website inquiries. The are white papers available on the website. If you email us at: sales@equitech.com we will get back to you more readily.